Ekrami, A., Bahrehbarpoor, M. (2005). High Temperature Behavior of Dual Phase Steels. International Journal of Iron & Steel Society of Iran, 2(2), 30-35. A. Ekrami; M. Bahrehbarpoor. "High Temperature Behavior of Dual Phase Steels". 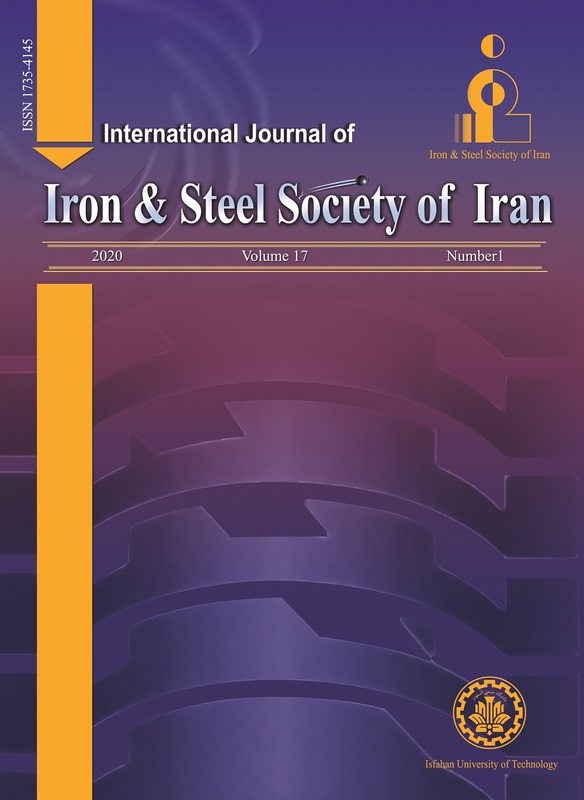 International Journal of Iron & Steel Society of Iran, 2, 2, 2005, 30-35. Ekrami, A., Bahrehbarpoor, M. (2005). 'High Temperature Behavior of Dual Phase Steels', International Journal of Iron & Steel Society of Iran, 2(2), pp. 30-35. Ekrami, A., Bahrehbarpoor, M. High Temperature Behavior of Dual Phase Steels. International Journal of Iron & Steel Society of Iran, 2005; 2(2): 30-35. Dual phase steels with different martensite volume fraction and morphology were tensile tested at a temperature range of 25 to 5500C. Stress-strain curves of all steels showed serration flow at temperatures of 250 and 3500C, and smooth flow at the other temperatures. Both yield and ultimate tensile strengths increased with increasing testing temperature up to about 4500C and then decreased at higher temperatures. At a given temperature, yield stress, tensile strength, and work hardening increased with increasing volume fraction of martensite. Similar behavior was observed by changing martensite morphology from network to fibrous martensite. The change in mechanical properties was related to the effects of dynamic strain aging, high temperature softening, and martensite tempering. E. O. Hall, Yield Phenomenon in Metals and Alloys, Plenum Press,New York, (1970). E. O. Hall, J. of Iron steel Inst., 170 (1952), 331. E. Pink, and S, Kumar, Mat. Sci. andEng., A20 (1995), 58. Y. Bergstrom, and W, Roberts, Acta Metall., 19(1971), 815. G. Shoeck, Acta Metall., 32 (1984), 1229. T. R. Mc Nelly, and S. F. Gates, Acta Metall.,26(1978), 1605. L. P. Kubin, and Y. Estrin, Acta Metall. 33 (1985), 397. L. P.Kubin, K. Chihab, and Y.Estrin, Y, Acta Metall., 36(1988), 2707. L. H. Almeida,I.May, and S. N, Monterio, Scripta Metallurgica, 19(1985), 1454. A. Karimi Taheri, T. M. Maccagno, and J. J. Jonas, ISIJ international, 35 (12), (1995), 1532. Y. Bergstrom, and W Roberts, Acta Metall. 12 (1973), 741. C. Gupta, J. K. Chak ravartty, S. L. Wadekar, and J. S. Dubey , Mat. Sci.Eng.A292(2000), 49. J. D. Baird, and A. Jamieson, JISI (1966), 793. J. D. Baird, and C. R. Mackenzie, JISI, (1964), 427. S.Lou and D. O. Northwood , Material Forum, 17 (1993), 153. S.Lou and D. O. Northwood , Canadian Metall. Quarterly, 31(1992), 225. ASM Handbook, Vol. 1., 10th ed., Int. material park, Oh,1996, 424. D. O. Davies, Met. Trans. A, 9A (1), (1978), 41. H. C. Chen and G. H. Cheng , J. Mat. Sci. 24 (16), (1989), 1991. A. J. Abdollah, L. r. O. Hein, M. S. Pereira, and. T. M. Hashimoto, Mat. Sci. Tech., 1 (15), (1999), 1167. S. Kim, and S. Lee, Met. Trans.A, 31A, (2000), 1753. A. K. Jena, and M. C Chaturvedi ,Mat. Sci.Eng.63 (2), (1984), 229. Z. Sun, Z. Wang, Z. and S. Li, Steel Research, 60 (5), (1989), 215.